Terex is dedicated to offering exceptional construction machinery and heavy equipment suitable for every job. Terex Heavy Equipment is designed for superior productivity and a high return on investment. The company is committed to providing high-quality products that are safe, reliable and cost-effective. Terex equipment is ideal for a range of industries including construction, infrastructure, quarrying, recycling, mining, shipping, transportation, refining, utility and maintenance. Dedicated to pioneering machines that withstand the test of time, Terex Trucks draws on over 60 years of expertise to create heavy-duty, durable machines that offer a productive work shift, with minimum downtime and maximum return on investment. With a coveted reputation for reliability and durability Terex Trucks are designed and built to deliver continual high performance, even in the most challenging operating conditions. May Heavy Equipment is proud to provide new Terex articulated and rigid frame trucks for sale in North Carolina and South Carolina. Built in Motherwell, Scotland, Terex trucks are robust, reliable and rigid, ready or the most extreme of hauling applications. 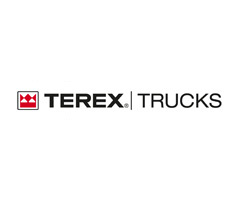 Terex trucks are also available for rent in Georgia, South Carolina, North Carolina, Virginia and throughout the rest of the Southeast. May Heavy Equipment is proud to provide you with Terex trucks for purchase or rent, to assistant our customers in the heavy construction, quarry and mining industries with the high quality, reliable and productive equipment they might require. Contact us today to speak to a sales representative about our inventory of Terex trucks, in addition to their service and repairs. May Heavy Equipment offers Terex heavy equipment sales and rental in SC and NC.